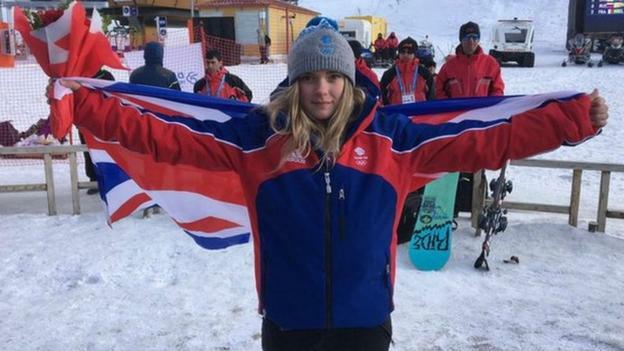 The father of British snowboarder Ellie Soutter hopes a foundation set up in her memory will help end the “vicious cycle” around young athletes’ funding. Soutter took her own life on her 18th birthday in July. Tony Soutter said “funding played massively” on his daughter’s mind and “the pressure took its toll”. “She would often ask not to go to competitions because she didn’t want us to have to take the financial burden of it,” he said. Soutter won bronze at the 2017 Youth Olympic Winter Festival in Turkey and carried the British flag at the closing ceremony. Her parents announced in July that they had set up a foundation to help young winter sports athletes with their funding. They are now at the stage where they can take applicants, her father told the Victoria Derbyshire Show. “A season can cost £30,000 – that’s how much we were looking at to get Ellie to all of the events, comps and with the accommodation, travel and training,” Tony Soutter added. “You can’t progress without paying out to go to these national and world championships. It is a vicious cycle. “Ellie was in a really dark place around this time and the pressure took its toll. She was depressed and we did get her some counselling. She was really low and it was like her sparkle had gone. “She felt like she couldn’t openly talk about her mental health, otherwise it would make it difficult to get the sponsorship she needed. The primary source of funding to British Ski Snowboard (BSS) comes from UK Sport, which goes towards providing support to athletes across a range of sports. BSS said athletes need to also make “significant contributions if they are selected and want to be part of a national programme” and welcomed the setting up of the foundation. Soutter’s father said the teenager suffered serious concussion in a fall when snowboarding three months before her death. Her parents have since been contacted by Boston University, which is researching Chronic Traumatic Encephalopathy (CTE) and the condition’s links with depression and people taking their own lives. CTE is a degenerative brain disease found in athletes, military veterans, and others with a history of repetitive brain trauma. “Unfortunately, Ellie had already been cremated so we couldn’t let them test her brain,” said Mr Soutter. “But as part of the work of the foundation this is something I want us to be able to help research and look into. You can watch the full interview with Mr Soutter on the Victoria Derbyshire Show on BBC Two and the BBC News Channel on Friday 25 September at 9:00 BST. Next articleWhat next for Russian-Israeli relations?